At NOMAD, our aim is to run a sustainable restaurant business. By working with likeminded suppliers, producers, growers and contractors we aim to minimise our carbon footprint. To this end, our chef sources as much of our produce as close as possible to the restaurant, minimising the distance that produce must be transported. We are a part of the CHOOSEWISELY campaign that aims to help restaurant patrons make informed choices about where they choose to dine. Our kitchen buys in whole animals that we break down on site and utilise the whole beast. Through our charcuterie, sauces and stocks our aim is to not waste any part of the animal that has been ethically raised for our consumption. 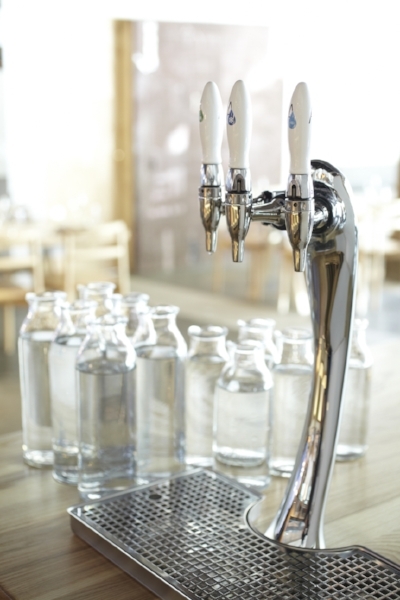 At Nomad, we choose to offer our diners Sydney's finest tap water which is chilled, filtered and carbonated on site. The system we have chosen negates the importation of carbonated bottled water shipped in from overseas. We filter, chill and carbonate Sydney drinking water instead of importing carbonated water bottled from overseas that also comes with a large carbon footprint. Currently the VESTAL water system eliminates the use of over four million single-use water bottles each year Australia wide. All other glass bottles generated within the restaurant are crushed and collected using the BOTTLECYCLER system. With every bin of crushed glass collected we save 33kg of CO2 emissions. We choose to support Australian growers and winemakers, as such our wine list is an all-Australian affair. Our focus is on vineyards and winemakers that buck the system, that bring passion to their craft, and as such, produce extraordinary wines through techniques such as bio-dynamic farming, minimal intervention, are chemical and sulphur free, and use minimal refining and filtering. By supporting these winemakers, many of them husband and wife operations, we are supporting diversity in Australian wine making. Working with our waste contractor JJ Richards we separate our waste into general waste, cardboard waste, plastic waste, metal waste and organic waste thereby reducing the amount of waste that goes to landfill by up to 80%. All polystyrene boxes used for the delivery of produce to the restaurant are returned to our suppliers for re-use. All our used cooking oil is collected and recycled to make biodiesel fuel: SCANLINE. Flow restrictors have been installed on all taps throughout the restaurant which has reduced water consumption by up to 65%. In the bathroom we use 100% recycled toilet paper that contains no chlorine, inks, dyes or scents: WHO GIVES A CRAP. Our office printing paper is: REFLEX 100% recycled, and we re-use each page to ensure we print on both sides. Our paper bags are made with recycled paper and our takeaway containers are made from plant fibre that will turn into soil within 90 days: WORLD CENTRIC. We only print menus quarterly, when the menu changes seasonally, we do everything we can to avoid re-prints and minimise paper usage. All light fittings in the restaurant are LED which use 7 times less electricity than incandescent or halogen light globes: LIGHT PROJECT. At the opening of NOMAD we were using charcoal, however the supplier was unable to give us an assurance as to where it was being sourced or whether it was a sustainable product. Instead we located an Australian company that sources firewood locally from forestry management and hazard reduction: BLACKHEATH FIREWOOD CO.
We are currently working with PINGALA to become a ‘host-site’ solar farm that our local community can invest in, generating clean energy and at the same time getting a great return on their investment. We enquired of the default hospitality superannuation fund as to whether they have any ethics based managed funds. Upon being told that they do not, we gave our staff the option to invest in AUSTRALIAN ETHICAL SUPER, a super fund that invests in clean energy, responsible banking, recycling, amongst other industries and avoids investments in coal, logging, sweatshop labour, gambling and other destructive industries.